Thanks to innovative hands-on activities, simulations, and technology, teachers have more tools than ever to help overcome the challenge of engaging students in history. However, trade books--especially nonfiction--are still a powerful way to connect students to the events of the past. Tillie Pierce: Teen Eyewitness to the Battle of Gettysburg by Tanya Anderson is one such nonfiction account that takes students to the front lines of the Civil War's bloodiest battle through the eyes of a 15-year-old girl who was there. In today's world, where students are thousands of miles removed from full-scale wars, Anderson invites students to step through a door to America's past and come face-to-face with the extraordinary sights, sounds, and smells that Tillie encountered. Using Tillie's own words from her 1889 book At Gettysburg: Or, What a Girl Saw and Heard of the Battle, A True Narrative Story as well as interesting, informative graphics and historical images, Anderson presents a well-researched account of Tillie's experiences as well as important background information about Gettysburg itself prior to, during, and after the battle. One of the aspects of this book I enjoyed most is the narrative style that Anderson uses to tell the story of Tillie. This is definitely not a dry, nonfiction account of the events at Gettysburg. It reads like a story, which will draw in students. While primary sources like Tillie's account are amazing windows to the past, I have found that language and writing styles from the past can be a barrier to students' comprehension of what the witness is describing. In this case, yes, Tillie was a teenager, but her language isn't necessarily that of today's teenager, and I thought that Anderson did an excellent job of conveying Tillie's story in contemporary, easy-to-understand prose. The excerpts from Tillie's book that Anderson did use in the book effectively describe not only Tillie's wartime experiences but also the range of emotions that this 15-year-old had witnessing such an extraordinary event. I also was fascinated by the graphics and images used to tell the story of Tillie. 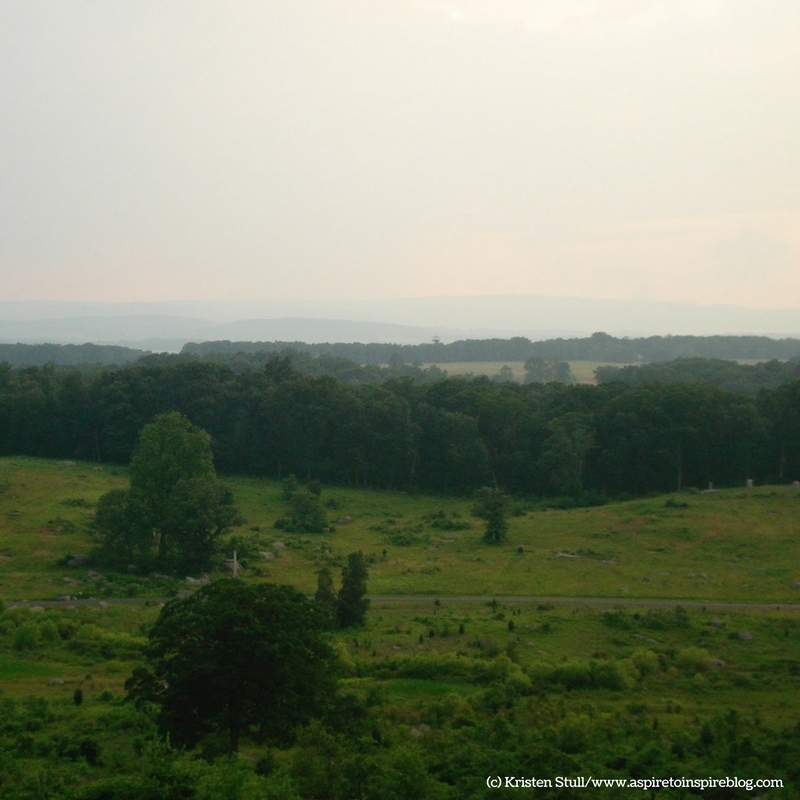 When I traveled to Gettysburg in 2009, I was impressed by the remnants of history left among the landscape of the town and battlefield. 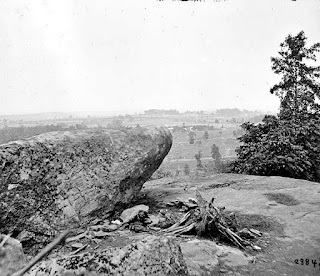 However, even though monuments and placards denoting significant sites dotted the area, envisioning the Gettysburg of 1863 still required some imagination. Thanks to the emerging use of photography in the Civil War-era, readers of Tillie Pierce are able to view images of the actual people and places of wartime Gettysburg, including those connected to Tillie Pierce's story. I had never seen many of these images before, but they were extremely helpful to me as I read the book. Along these lines, the book also includes standard nonfiction features, such as interesting sidebars, charts, and maps, to support the text. The structure of the book is well-organized by chapters and subheadings within. Each subtopic within the chapter is a short read, which lends itself to being able to stop and reflect on the information presented. Most, if not all, subsections of the chapters include images or visual aids that tie into the topic being discussed. The book is not simply page after page of nonfiction prose. 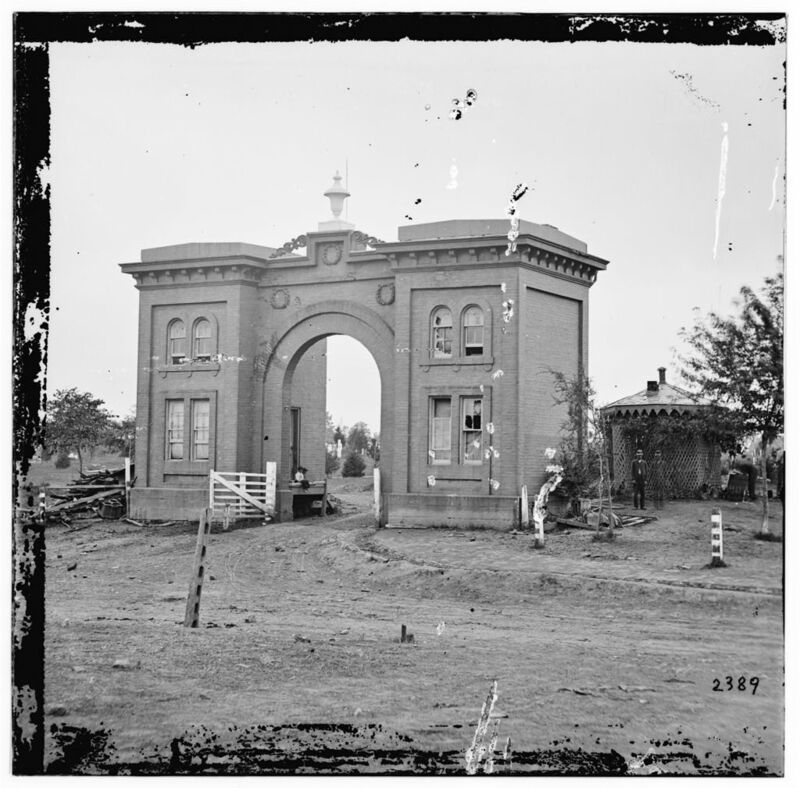 The book begins with an introduction to Gettysburg with a short history of the town up until the Gettysburg that Tillie grew up in. From there, Anderson introduces individuals and families associated with Tillie. 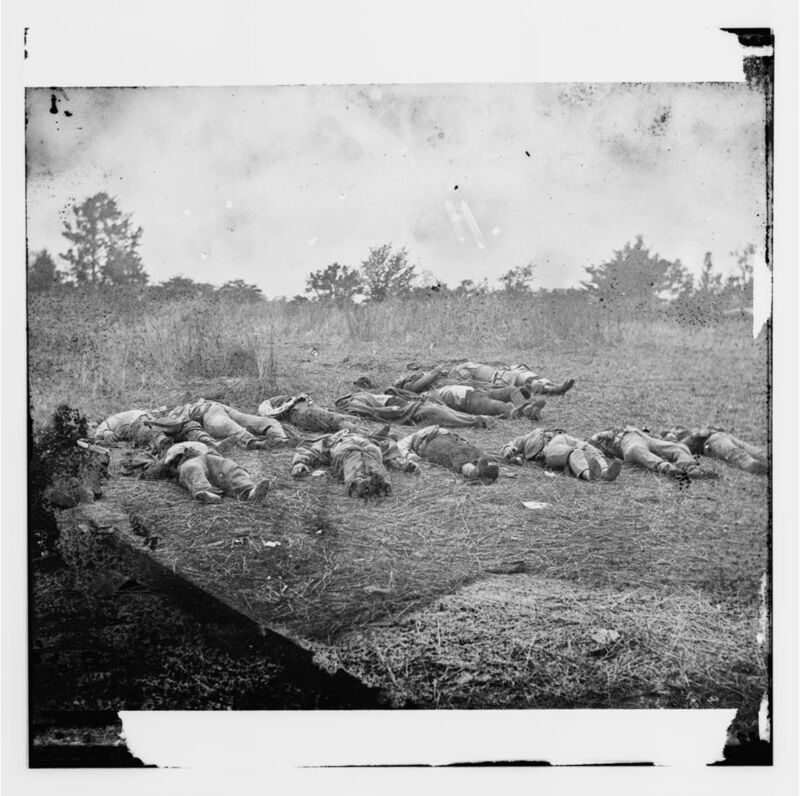 Several chapters describe the build-up to the battle then the battle itself, including Tillie's movements, activities, and thoughts during it. 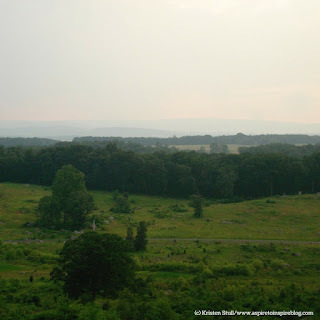 As the book closes, readers learn about the aftermath in Gettysburg as well as what happened to Tillie, her family, and the other individuals connected to her story. The book is 96 pages, with eight chapters, an epilogue, and a detailed resource section in which Anderson provides source notes, bibliography, resources for further information, and an index. She also includes an interesting feature called "Taking Tillie's Path" that provides the blueprint for a virtual tour of modern Gettysburg using Google Earth. 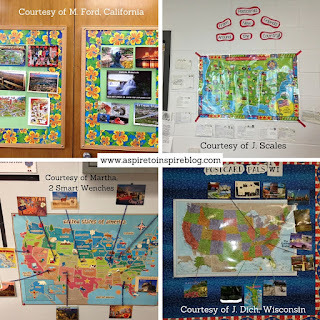 Through this activity, students can see the the places that Tillie saw as they are today. 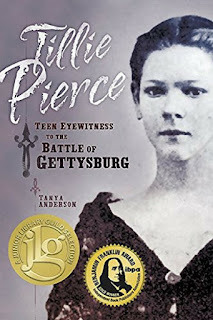 Tillie Pierce: Teen Eyewitness to the Battle of Gettysburg is published by Quindaro Press of Kansas City. It was a 2014 YALSA Excellence in Nonfiction Nominee, a Junior Library Guild Selection, a 2014 IBPA Benjamin Franklin Award (Teen Nonfiction) winner, and a 2014 NCSS/CBC Notable Social Studies Trade Book. You can order a signed copy with FREE shipping here. You can also visit Tanya Anderson's online home here. P.S. Tanya Anderson has another book coming out in October 2016 entitled Gunpowder Girls, which tells the stories of the three worst arsenal explosions during the Civil War, the victims of which were primarily poor, immigrant women and girls who worked in the arsenals. It looks intriguing! 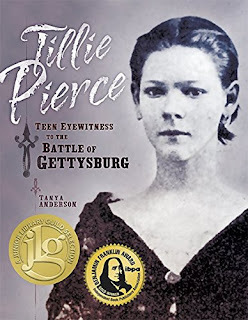 Have you read Tillie Pierce: Teen Eyewitness to the Battle of Gettysburg? How would you use this book in your classroom? Leave a comment! 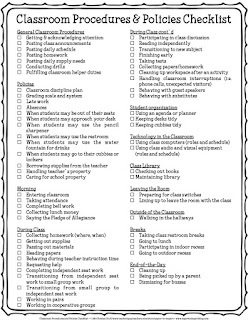 Having classroom policies and procedures in place just makes life easier for any teacher. I'm not exaggerating when I say that when I could find a way, I would create a procedure for any activity. Even with so many "official" ways to do things, my classroom did not resemble a cruel dictatorship. Instead, days went smoothly because students knew what was expected of them (and why), and they took ownership of their actions. The key to the effectiveness of my policies and procedures was to provide structure and consistency that produced independent, responsible, and disciplined students. Most recently, I taught 5th grade. It's such a great age, in my opinion, because you can challenge students to be more independent and prepare them for the rigor and personal responsibility necessary to navigate middle school successfully. I requested a lot of my students, probably more than some were used to having to do on their own, but the reward for many was pride and more confidence in their abilities. In addition, most of my procedures and policies did not require my participation, which built independence in students and freed me up to focus on instruction, planning, and other tasks. Step 1: Develop your policies before you develop your procedures. Before I could create procedures for any activity or task, I needed to develop the policies that would inspire the procedures. The difference between a procedure and policy is that a procedure outlines the step-by-step way to complete a task while a policy explains the guidelines and goals upon which the procedures are based. To create policies, I first had to develop a vision for the environment I wanted in my classroom. My vision was what I described earlier: structure and consistency that built independence, responsibility, and other productive characteristics in students. My policies (and consequently my procedures) reflected this vision. From the moment students walked in the door in the morning until the moment they walked out, students knew what they were supposed to be doing. If you know what you want your classroom to feel like, it makes it easier to determine the procedures required to make it that way. First, students had to do attendance and lunch count by moving their avatars on the SmartBoard to the Buying or Packing column. Next, they put away belongings and checked supply needs for the morning. They brought all supplies to their desks so that they did not have to get up during class to get anything from their cubbies. After that, they looked at the board to see what homework, forms, and other take-home items needed to be turned in and where. Then, they placed any notes to me in a basket next to my desk or any notes to the office in a bag that went down to the office daily each morning. Next, they looked to see what the bell work assignment was. For example, sometimes it was a journal entry. Other times, it was a review activity from a lesson we had done earlier in the week. It changed daily. After the bell work assignment was completed, students read silently or worked on other assignments. 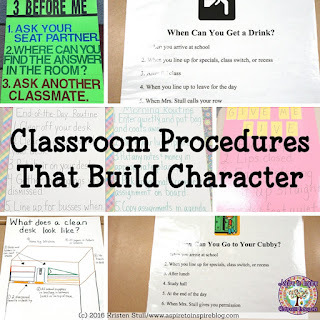 My absence procedure was probably one of the most challenging procedures that the class had to handle, but it went a long way toward building personal responsibility and problem solving skills. I created an absence work box (a portable file case) in which I placed tabs for each subject. Behind each tab was a folder with a day of the week listed on it. 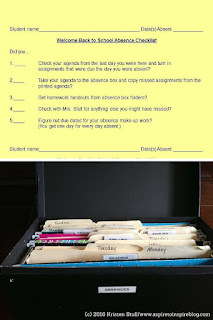 I would place all handouts (with students' names written on them) in the absence box when students were absent. They would have to take their agendas to the box; copy missed assignments from a printed copy of a list of work we completed while they were gone; and collect work from the folders of the days that they missed. 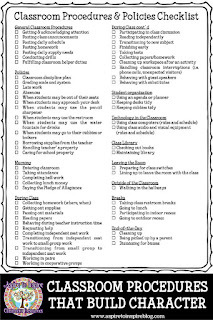 To help them think through the process, I also created an absence checklist that walked them through the absence procedures. 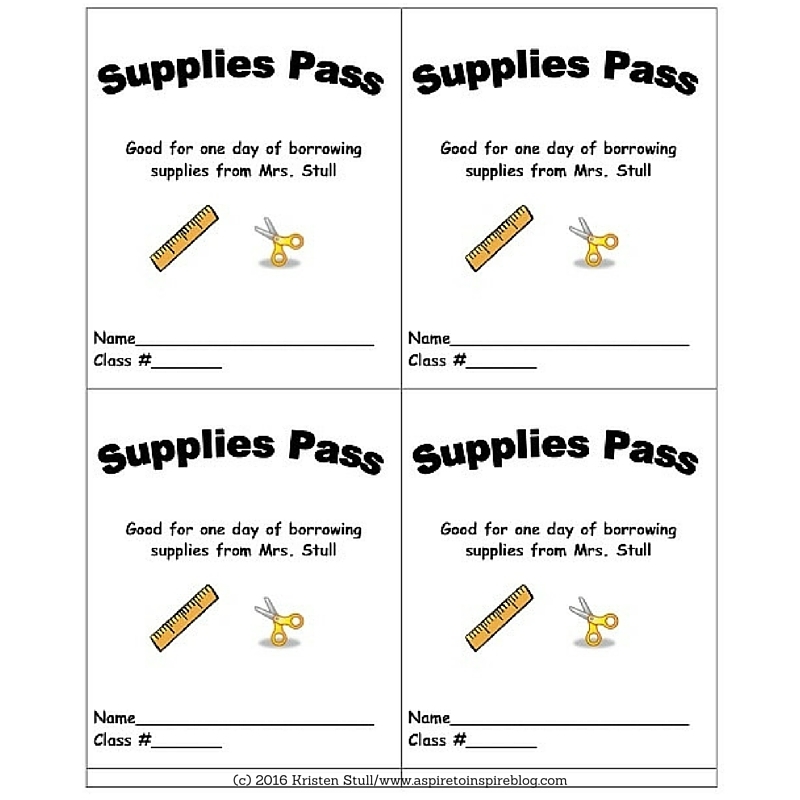 To encourage personal responsibility, my procedure for borrowing supplies involved me giving students two passes per nine weeks that they could use to borrow items from my cabinet. 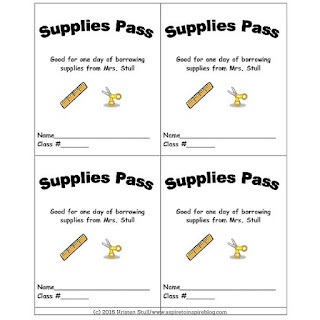 Once they used the passes, they could not borrow again unless they earned additional passes through our class rewards system or the new nine weeks started. When students borrowed items, not only did they have to present a pass, but they also had to give me a piece of collateral--something of value--that I could keep until they returned my items. Most of the time it was a notebook or textbook for a subject that they didn't need at the time. However, sometimes, I ended up with some interesting treasures such as PE shoes or class restroom passes (another character-building procedure I came up with!). 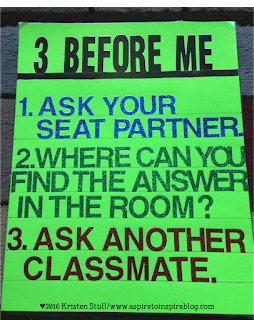 To encourage problem solving, students were required to seek "Three Before Me" when they had a question. 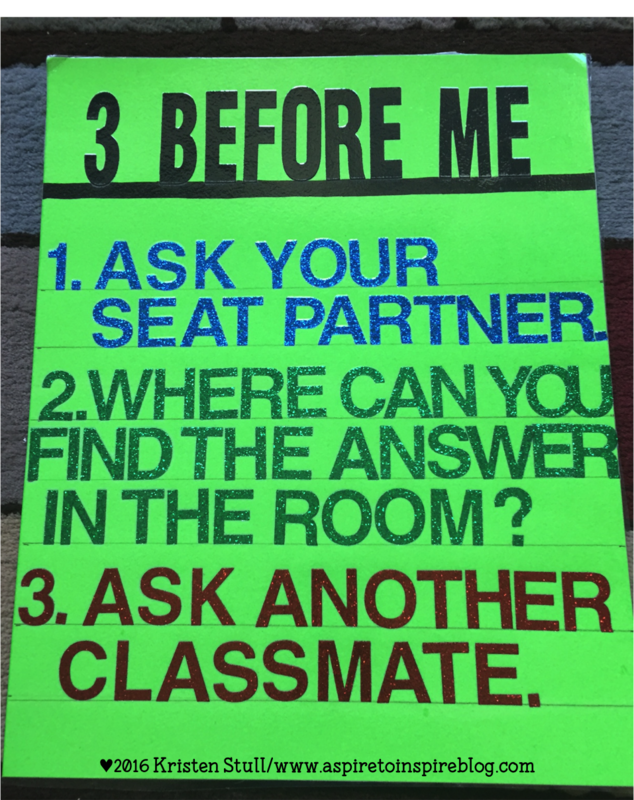 Instead of first coming to me, they had to ask a seat mate, look around the room for the answer, and/or ask another classmate. Step 2: Make an inventory of activities and tasks. To inventory what exactly my students routinely did every day, I ran through a typical day in my mind. From that, I made a list of activities and tasks that students undertook on a regular daily or weekly basis. Using this list, I knew what I had to develop procedures for. Step 3: Divide and conquer. I also had a general classroom category for activities and tasks that occurred throughout the day. Work on one category at a time. Chances are that some procedures lead into other procedures so keep an extra notebook on hand to jot down ideas, issues, and other considerations that come up. FREE RESOURCE ALERT! 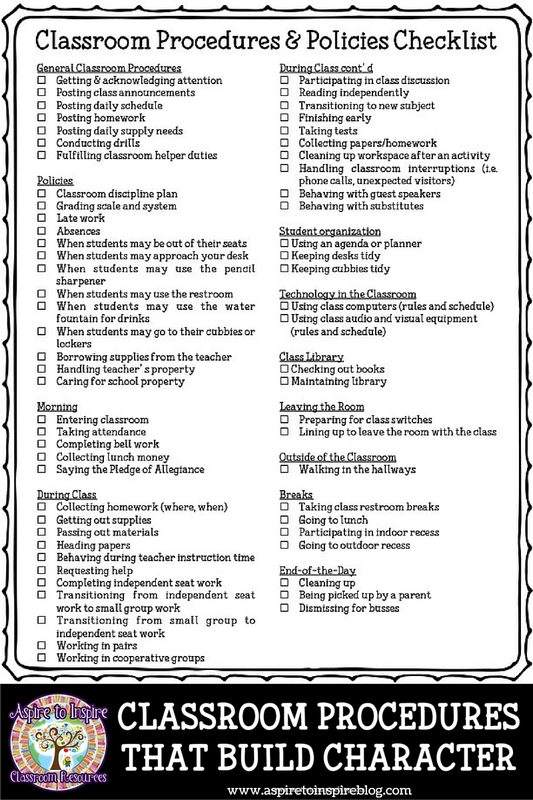 Here's a printable checklist of tasks organized by category that I used to create procedures for my own class. Step 4: Create procedures that reflect your own policies and vision for the classroom. 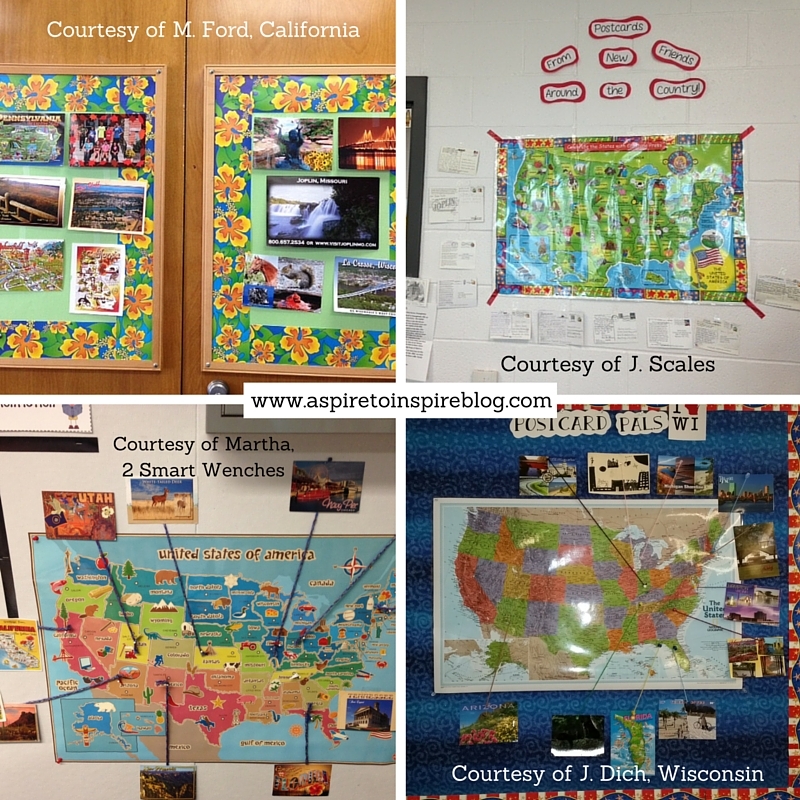 Creative and successful ideas for how tasks can be accomplished in the classroom are everywhere. Keep in mind, though, that you must decide what will work best for you. I have implemented ideas I've seen elsewhere before that I thought were really great. And they were...for someone else's room, as I found out. I ended up discontinuing them before the year was out. Make sure your vision for the classroom shines through your policies and procedures. Decide how independent you want your students to be. Look at your organization systems and see what procedures are needed to complement them. Ask yourself if you really need procedures for some tasks or if you're okay without them. Step 5: Keep procedures simple. Keep procedures simple so that students can easily recall what's expected of them. Most of my procedures were no more than 5 steps. Step 6: Label and post. One of the best purchases I made for my classroom was a label maker. I labeled almost everything, and this came in handy for procedures because the labels answered questions that I didn't have to, such as "Where does this go? ", "Where do I put this? ", and "Where can I find...?" Also, post procedures when you can. This is where, if you enjoy being creative, you can make colorful posters and reminders. This also helps curb the same questions I mentioned earlier. I posted mini-posters in the general vicinity of where some tasks took place (ex. drinking fountain, cubbies). I also had a dedicated area for class information where I posted other procedures such as those for drills. Step 7: Take time to explain and practice procedures. The first week of school--no joke--I spent most of the days explaining and modeling procedures. Then, I asked students to practice them. Devoting time to students learning and applying what's expected of them goes a long way toward building the independence and personal responsibility that they need to have for the school year. 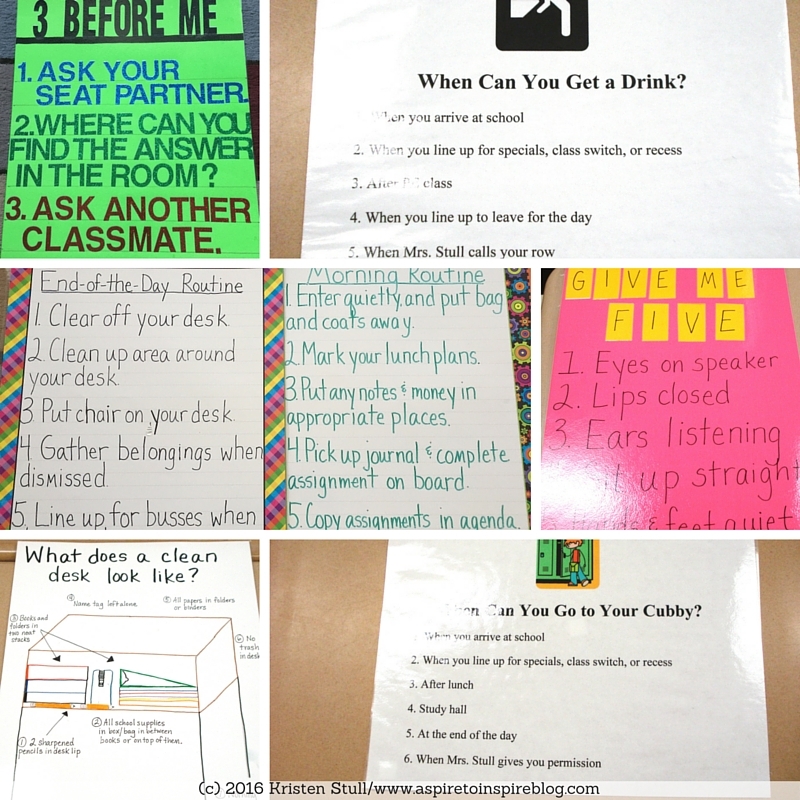 Reinforce the procedures through quizzes, games, activities, and discussion. And do it often! I continued to model procedures aloud for several weeks after the year began just so students could see them in action and commit them to memory. Step 7 1/2: Take time to explain policies. The reason "because I said so" never sat well with me as a kid, and I'm sure things haven't changed for the latest generation of kiddos either. By explaining why I set up procedures the way that I have, I found that students appreciate and buy into the classroom environment that I'm trying to create for them more readily. Kids can be very perceptive. When they see that rules and procedures aren't arbitrary or created by an adult on a power trip, many are willing to follow them because they believe that they were made for their benefit. You can't expect students to follow procedures if you don't do it yourself. Consistency not only reinforces how to complete a task, but it also eliminates many gray area situations. Very seldom did my procedures or policies cause confusion. Perhaps students (and sometimes parents) felt some frustration at times, but I found that conflict resolution came much easier by having consistent procedures and policies to which to refer. So now it's your turn. Do you have questions about any of my procedures? Any tips for teachers looking to create or improve their own? Leave a comment! As a teacher, it's important to remember that we are surrounded by many different personalities in our classrooms. 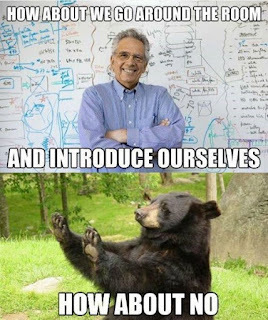 Chances are, some students feel similarly about icebreakers as I do. Alas, I'm not a total killjoy. I think that icebreakers can be very useful if the right questions are asked, and the activity is facilitated in the right way. 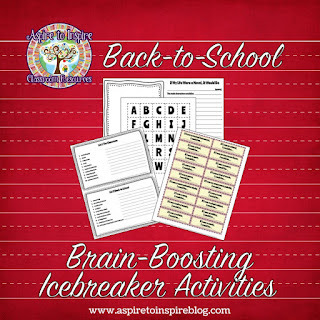 When done in a constructive way, icebreakers not only help us to learn about our students but also go a long way in building classroom community. When it comes time to learning about my students and students learning about each other, I like to dig deep right off the bat--but in fun and interesting ways! 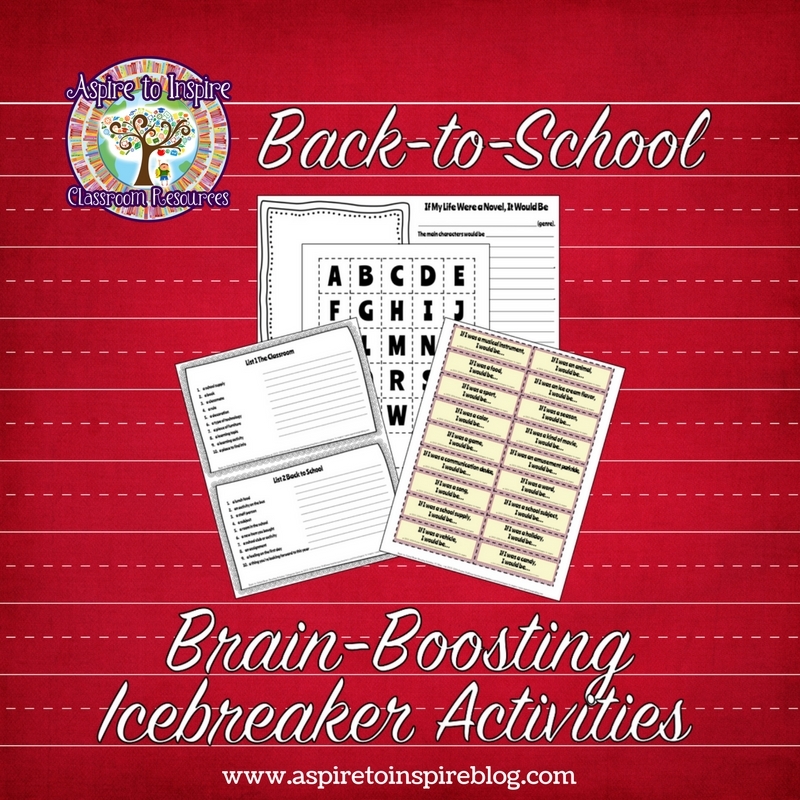 In this activity, students complete prompts with answers that reflect their personalities. 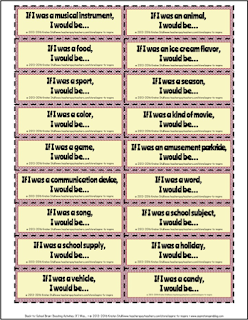 Here are a couple of examples: "If I was a musical instrument, I would be..." or "If I was a school supply, I would be...." Answering the prompt is only part of the activity. I ask students to explain why they answered in the ways that they did, and I am fascinated by the responses that students come up with. Disclaimer: I'm not a psychologist, and I can't decipher the deeper meanings of students' answers. It's just really interesting to see how students compare themselves to the objects and ideas in the prompts! 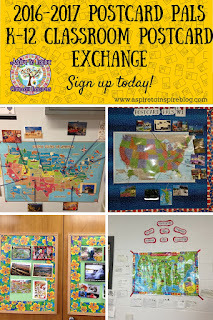 Choose a prompt as the focus of a bulletin board and have students illustrate their responses. This literacy and art activity allows students to share about their lives while demonstrating understanding of literary genres. Using a template like the one shown above, each student chooses a literary genre that best represents his or her life. Then, students expound on their genre choices by writing about the characters and settings in their lives as well as summarizing their stories. Students can summarize what they hope their lives will be like over the course of their entire lifetime. Be sure to review common literary genres (fiction, nonfiction, etc.) 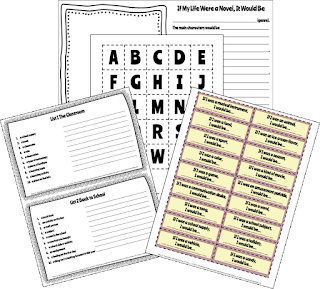 with your students, and invite them to relate sub-genres such as suspense; melodrama; comedy; tragedy; romance; mystery; biography; fairy tale; and adventure, among others, to their lives. 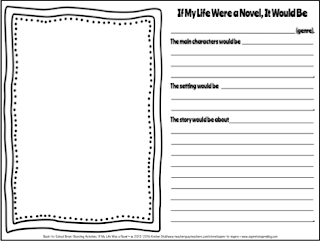 After students write about their lives as novels, invite them to illustrate a cover of their novel as way to further share about themselves and their life stories. Anytime you can use a well-known game or game show in the classroom it's a winner in my book. This back-to-school game is based on "Scattergories." While this activity isn't as personalized as the previous ones, it is a lot of fun--and asks students to be thoughtful at the same time. It provides a window to how students think, which is valuable as you get to know them as children and as learners. 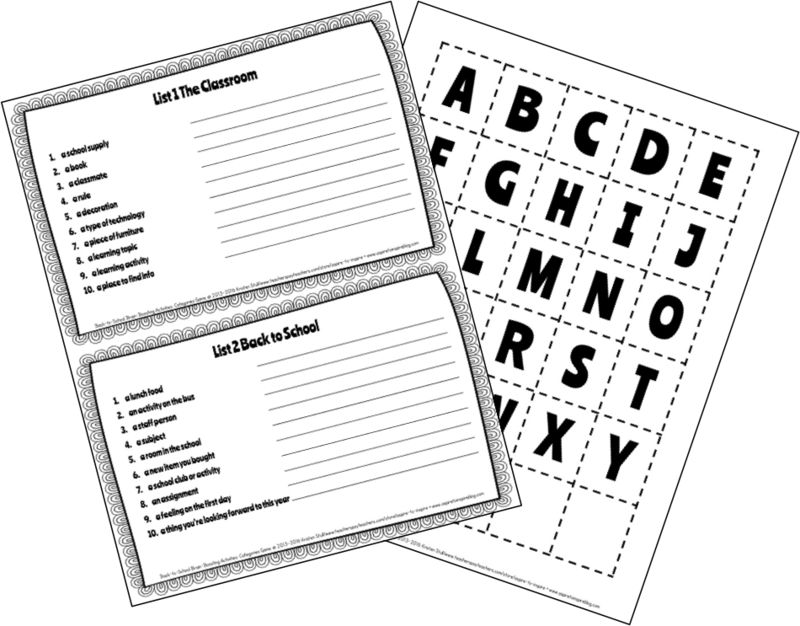 To play, every student gets a blank game card with categories listed. You randomly choose a letter. Start a timer of between 3-5 minutes. Then, let students try to complete their entire list of categories with answers that only begin with the chosen letter. (For example, if the letter is G, and the category is school supplies, you could write "glue.") Students score a point for every unique answer they have (i.e. no one else can have the answer). This game can be played many times since you can use the same list with a different letter each time you play. Divide students into small groups, and have them play against each other. 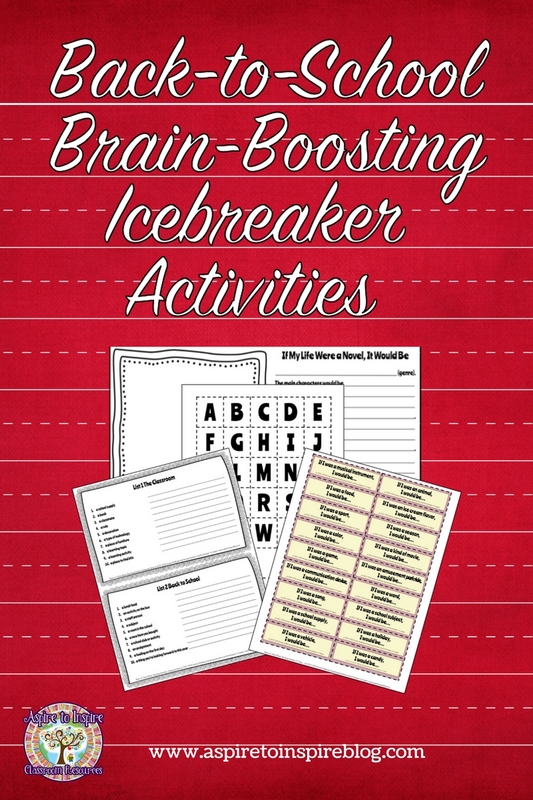 Are you interested in trying these icebreaker ideas in your classroom? Click here or on the image to download these for FREE! What are some of your favorite icebreakers that you use ? 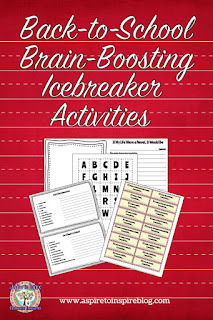 Do you have any other brain-boosting icebreakers that you would like to share? Leave a comment! Is it me, or have some dollar stores really kicked it up a notch with their inventory? Since originally posting my list of dollar store treasures for the classroom, I've found even more goodies during my weekly trips to my local dollar stores. 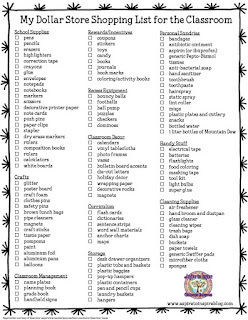 So I've updated my list AND created a printable shopping list for you to take with you the next time you're looking to stock up your classroom! I enjoy browsing the aisles of dollar stores. So many practical items on the cheap. And now that they carry teaching and classroom supplies...oh, yeah! 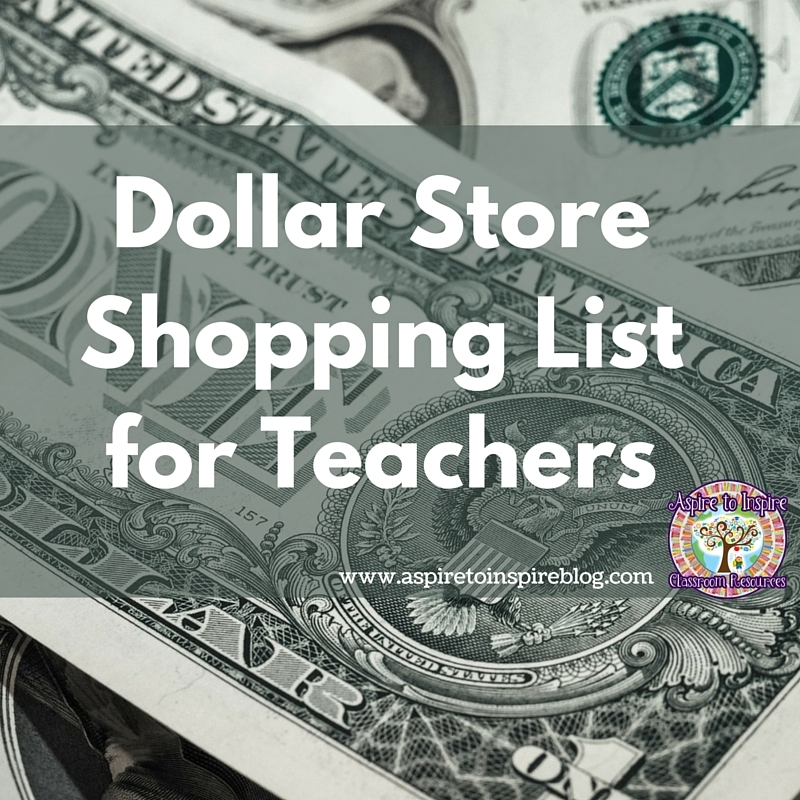 For some reason, though, dollar stores have yet to become my go-to for a teacher's little necessities. When the need arises, I often end up overpaying for the same stuff at the supermarket that's four doors down. This list will have a permanent home in my wallet, and you're welcome to make a home for it in yours as well. No more punch-in-the-gut realizations that I spent three times as much on glitter than necessary! 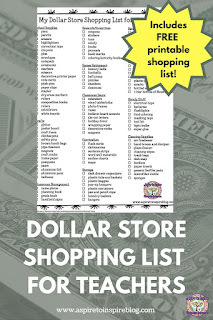 Okay, here's a printable shopping list to take with you the next time that you gather your George Washingtons for a trip to the dollar store. Your turn to add to the list! What about your dollar store finds? 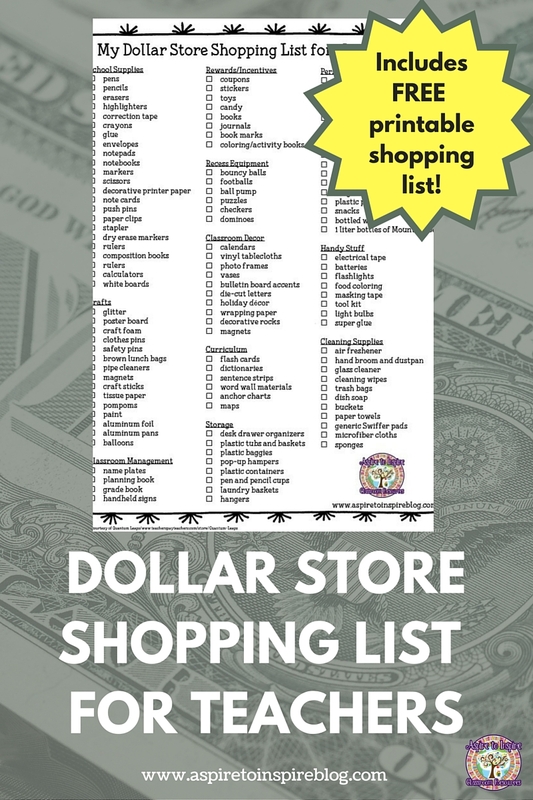 Leave a comment with some of the other treasures you've found at dollar stores. 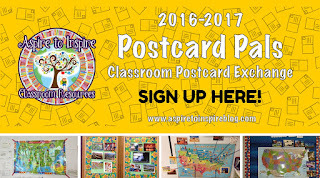 The Official Postcard Pals 2016-2017 Sign-Up is LIVE! Wow! 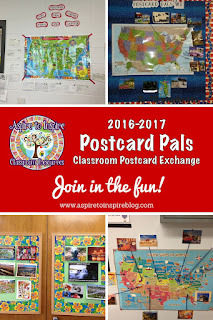 I'm thrilled with the response to bringing back the classroom postcard exchange. With more than 100 classrooms expressing interest, that means that the 2016-2017 Postcard Pals Classroom Postcard Exchange is ON! The next step is for teachers to officially sign up. Here is the 2016-2017 Postcard Pals sign up form. The form will be open until AUGUST 20, 2016. At that point, I'll begin working on mailing group assignments. 1. Use or create an e-mail address that accepts e-mail messages from my blog e-mail address. Some school addresses have very fortified firewalls so if you use your school e-mail, please make sure that it accepts e-mails from info@aspiretoinspireblog.com. If it doesn't, I recommend setting up an e-mail address specifically for this exchange at a free e-mail provider such as Gmail or Yahoo. 2. 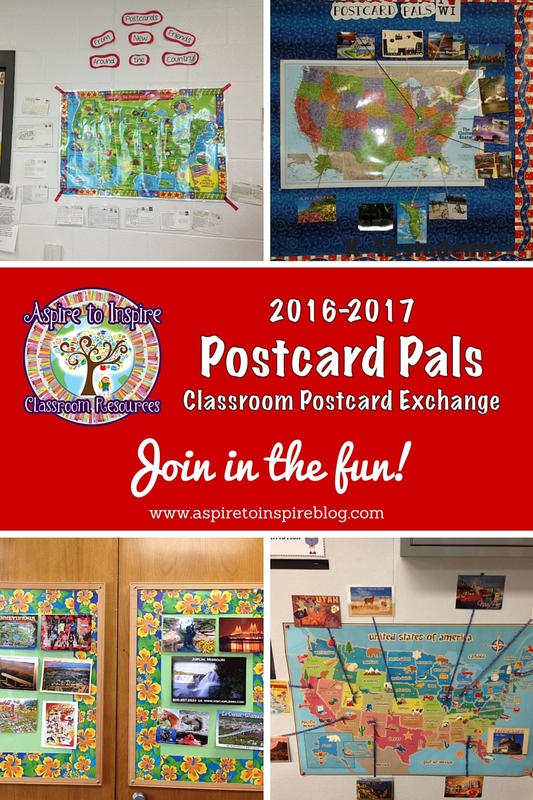 Send a one-time paper postcard to every class in your group (est. 30-40 cards) by the mailing deadline. 3. Update a Google spreadsheet to indicate that you have sent your postcards (simply entering a date--easy!). 4. Complete a short feedback survey about your experience after the exchange. By overwhelming preference, the postcard exchange will involve traditional paper postcards. Each class is responsible for supplying its own postcards and postage. I will provide you with some ideas for inexpensive or free postcards as well as funding options when I send out the instructions and mailing lists. You will receive your mailing list and instructions in early September, and postcards will need to be mailed by the end of October. Please make sure that you are able to work on this project within that timeframe before you commit to the exchange. The only information that will be shared with others on your mailing list is your name, school name, and address. All other information that I request from you will be seen and used by me to communicate updates about the exchange only. Okay, I'm off to check the growing list of official participants. Hope to see your name on that list! So continuing with the theme of my last two posts about making the most of the summer by getting in on some unique learning experiences for students before the next school year starts, I'm going to offer one to you myself! Postcard Pals is making its triumphant return after a year hiatus with what I hope will be the best exchange yet. I have coordinated Postcard Pals since 2013, and I'm really happy with the results of both exchanges I've done. (Some of the participants must have been happy, too, because they signed up for another year!) You can read more about past exchanges here. 1. Teachers (public, private, and home school are welcome) sign up, and depending on the number of classes, I divide up classrooms into groups of 20-30 classes. I do this to keep costs low for participating classrooms as opposed to asking them to send 100+ postcards. I also--as best as I can--divide by grade band, usually PK-2, 3-5, 6-8, and 9-12. 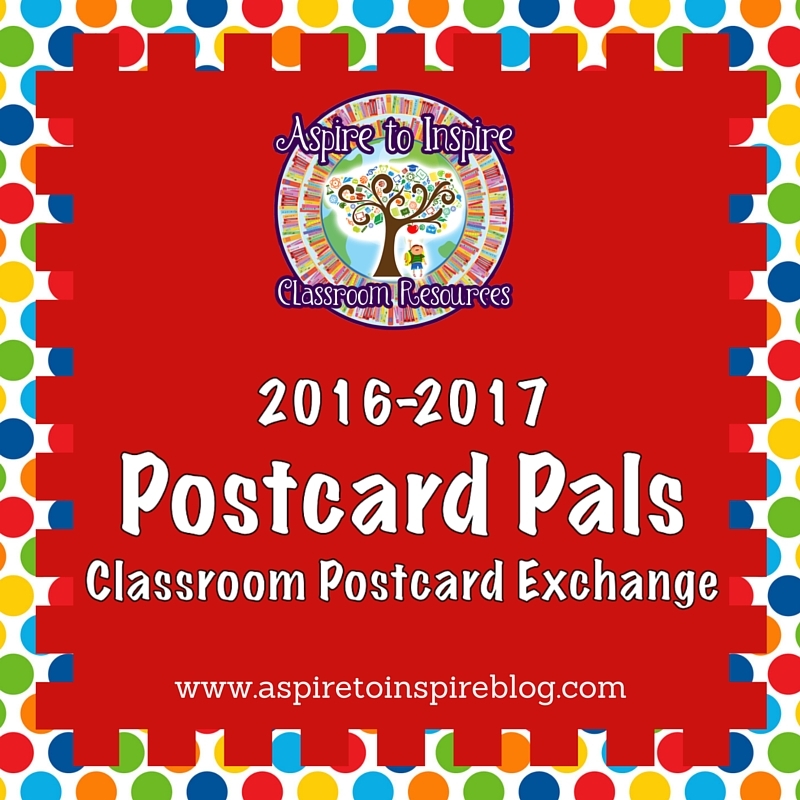 Each teacher is then responsible for sending one postcard from his or her class to each of the other classes in his or her group. Postcards include information about the geography, economy, history, and other interesting facts about the state in which the class lives. Signing up commits teachers to sending one postcard to each class on their mailing list. If teachers want to establish a pen pal program beyond the one postcard, they are welcome to do that; however, I don't facilitate that. It would be up to the classes involved to work that out. 2. At the beginning of the year (September, usually), I provide teachers in each group with detailed instructions about what should be included on the postcards along with a mailing list of classrooms in their groups. I give a deadline by which postcards should be sent so that everyone knows by when they should expect to receive their postcards (usually October or November). I ask teachers to indicate that they have sent postcards by updating a Google spreadsheet (very easy to do) with the date that they sent them. I use this spreadsheet to follow up with teachers who have not sent postcards. 3. Let the postcards roll in! I love to receive photos and comments about how the exchange is going, and I encourage participants to stay in touch. 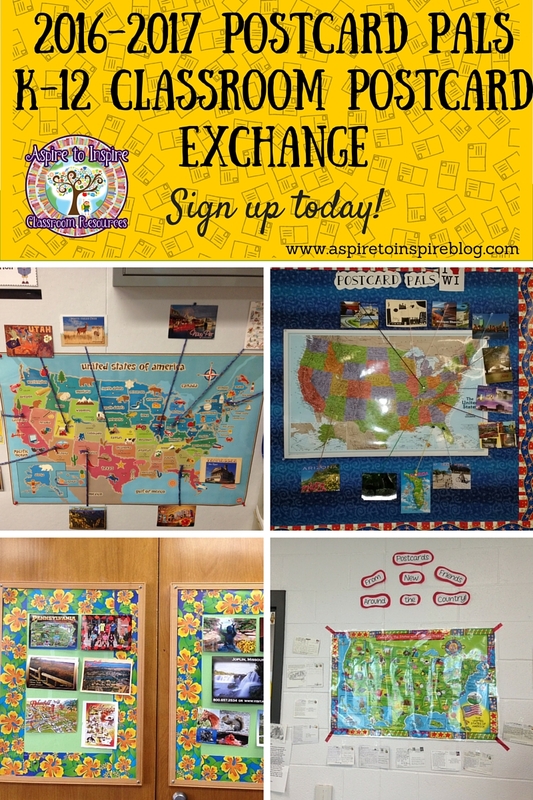 Many of the photos I receive show bulletin boards prepared especially for the exchange, which is so fun to see. In year one, I had 130 classrooms signed up, and in year two 43. Now, that's a big difference, I know. However, year two actually had a higher success rate of follow through on those who committed to participate so that's a good thing! While this an intermediate blog, I do open this exchange up to K-12 students. I've had all grade levels from across the USA participate--and even a few outside of the country--which is quite exciting. Step #1 is determining interest, which is what I'm doing in this post. If you're interested in learning more about this exchange, please complete this Google form. Completing the form in no way locks you into a commitment to join. Once I finalize details, I'll set up another form to officially sign up. Please share this with colleagues and teacher friends! Pin it, tweet it, post it, sky write it with an airplane...just please help me get the word out. Step #2 is thinking about how to improve Postcard Pals. This year, I'm looking into some different options, including possibly making it a virtual postcard exchange to defray the cost of sending postcards via snail mail. Nothing is set in stone, but it's an idea rattling around in my head. I will also be incorporating feedback from past participants into this and any future exchanges as I know we ran into some issues with people not following through on their commitment to take part. Click HERE to complete the Google form for more information. I think that's it for now. Hope to see many of you joining the fun! Have you ever done a postcard exchange? Tell us about it in a comment!